Fenton glass is a type of handmade colored glass. The glass is turned into striking art pieces and functional home decor, such as vases, lamps and candy dishes. Fenton glass is collectible, but the company turned to producing practical glassware during World War II to provide Americans with affordable mixing bowls and tableware. The Fenton Art Glass Company was established in 1905 by brothers Frank and John Fenton. They based their company out of Martins Ferry, Ohio, in an old glass factory. The original production line featured glassware made by other companies with painted art provided by Fenton. Once the brothers acquired a new glass factory in Virginia, they were able to introduce their own glass colors and designs. Fenton became one of leading companies to produce collectible artistic glass. 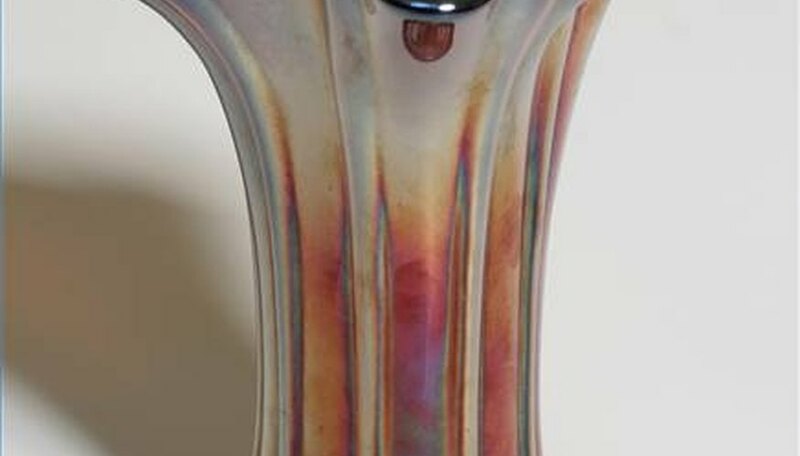 The first Fenton glass original was created in 1907, just two years after the Fenton brothers established the company. Until World War II, the Fenton Art Glass Company provided Americans with detailed carnival, agate and chocolate glass creations. World War II brought about significant changes in the American way of life, which also affected Fenton. Fenton began creating tableware instead of intricate pieces of art. This was also the period when Fenton created the buzz for a Hobnail glass pattern. Fenton announced in 2007 that it planned to cease operations, but consumer demand kept the company in business. Differentiating authentic Fenton glass from an imitation can be difficult, but you can look for some specific identifiers. Search for the ware number and mold number. These numbers are helpful when you want to look up a piece of Fenton glassware in a catalog or price guide. Even pieces that were not created as part of a specific line will have these numbers. Serious collectors should also invest in Fenton art glass books. These reference guides provide information about the production of specific pieces, values and rare pieces not listed in Fenton catalogs. Condition is an important quality for collectible glassware. Fenton pieces in excellent condition are worth more to collectors. Before purchasing a piece of Fenton glass, check to see if a Fenton sticker is still attached to the bottom of the piece. For Fenton glass bells, the clapper needs to be intact, without damages or repair work done to it. Noticeable bubbles in the glass or a piece that is chipped will decrease in value. Fenton has always released factory seconds. These items were not in mint condition from the start, making them less desirable for collectors. Fenton glass is highly valuable when it is in mint condition, is from a limited line or was manufactured before the 1950s. According to Fenton's latest catalog, many new glass pieces have a retail price of under $100, making it easy to collect new pieces as they are released. Older pieces can be worth more. Warman's Identification and Price Guide lists many older Fenton bells at $25 to $75 each. Candlesticks can be worth up to $45. Some items, such as a bowl from the red carnival glass line, can be worth more than $1,200. Prices will vary depending on demand for specific items.